As DISC grows in popularity, the number of variations on Marston's original technique also expands to meet different needs. Behind all these variations, however, lies a set of standard principles that any questionnaire must meet to claim the name DISC for itself. In this section, we will outline the way the questionnaire works, and look at different ways in which it can be administered and marked. Each DISC questionnaire consists of twenty-four questions. This is markedly fewer than many other assessment techniques, which can consist of anything up to six hundred questions. 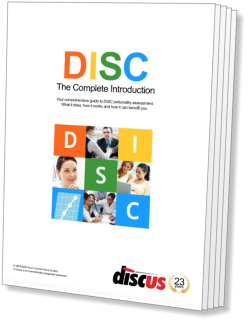 DISC's ability to construct an effective behavioural profile from such a simple question set is undoubtedly a major reason for its success. Each question consists of four options. For each question, the person completing the questionnaire is asked to select one of the four that describes them most closely. This having been done, they are asked the opposite; which of the remaining three options describes them least closely? As you might imagine, this simple process is very rapid to administer, taking on average ten minutes to complete, and almost never more than twenty. Administration conditions vary little. Typically, the candidate is asked to imagine themselves in a working frame of mind while completing the questionnaire. Individuals who are not currently in work are asked to imagine themselves in their last job. These administration instructions are an adaptation from the original form, designed to tailor it more closely to commercial use. In Marston's original questionnaire, the four options making up each question were simple adjectives. A candidate would be asked, for example, whether they considered themselves most gentle, attractive, persuasive or brave. Interpretations of words change over time, of course, and from country to country, and DISC has been adapted to take this into account. This situation has been eased somewhat by the introduction of phrase- or adjective-based question sets, replacing the traditional four adjectives with an entire statement. Examples of such statements might be 'I try to help others when I can' or 'I believe in standing up for my rights'. This expansion of the original question set helps to reinforce its meaning, and reduces the possibility of misunderstanding by the candidate. Collecting a person's responses to a DISC questionnaire is only the first part of the process of profiling. Once this information has been acquired, it will need to be collated and marked to produce a DISC profile. Performing this task manually can be an arduous task, and is unavoidably prone to errors. For this reason, many vendors have introduced labour-saving techniques such as telephone marking, or complex systems of colour-coding. Probably the only real solution to this problem to have appeared to date is the use of computers to expedite the marking and calculation process.